We have examined how the Higher Reality has been conceived and perceived as an indivisible triune of Existence-Consciousness-Bliss (Sachchidananda) in an ‘absolute’ poise. The Higher Reality loses its ‘unitary’ poise at the lower level of Reality to enable the emergence of multiplicity – the creation. It becomes divisive, relative and finite and appears as an ‘inverse’ Sachchidananda. Chapter XIII of the Life Divine raises this question: HOW DOES THE ‘ABSOLUTE’ GET CONVERTED INTO THE ‘RELATIVE’? HOW DOES THE ‘INFINITE’ BECOME THE ‘FINITE’? This question becomes one of the most intriguing questions of existence because the ‘finite’ basks in its ‘uniqueness’, in its ‘individuality’ and being ‘disconnected’ from the ‘unitary’ poise of the ‘Infinite’. ‘I am Maya and universe is my cheat. O soul, inventor of man’s thoughts and hopes. Why did this illusory Maya persist in the human psyche? (a)	Psychologically, the human life on earth is a constant confrontation with the forces of adversity- the forces of darkness, suffering, evil, falsehood, ignorance, death- the forces of failure, defeat, conspiracy, treachery that tend to swallow all attempts to progress. This is why the ‘unreality’ of the world too easily overwhelms our conventional world-view. 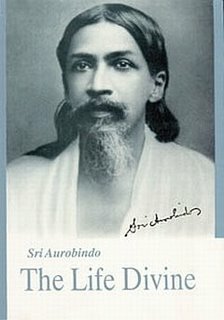 (b)	Metaphysically, it was not ‘known’ how a ‘transformation’ of human life was possible as an alternative to ‘liberation’ and the emergence of a new species in the evolution of consciousness with faculties higher than the present human mind was an endeavour worth attempting till Sri Aurobindo ‘revealed’ the Secret. The moment Sri Aurobindo hints the possibility of ‘transformation’ of the lower reality in terms of the Higher Reality as an alternative to ‘liberation’ or dissolution of the lower reality in nothingness to give way to a featureless Higher Reality that surpasses all cognitive descriptions of Sachchidananda; it becomes imperative to construct a new paradigm of a Higher or Divine Maya to supplement the lower or illusory Maya. At the end, the lower Maya leaves the relationship between the ‘Absolute’ and the ‘Relative’ as a dual and irreconcilable antithesis. Sri Aurobindo has to re-construct a non-paradoxical, non-illusory paradigm of Maya to explain how the Absolute ‘manifests’ or ‘creates’ the relative. We shall follow the steps He takes. 2)	The skeptic will immediately ask: There is a difference between the individual ‘creation’ and the cosmic ‘creation’ and wouldn’t it be preposterous to equate them? Sri Aurobindo is aware of this apprehension and He himself raises a second issue. As the ‘Infinite’ has the capacity of manifesting infinite potentialities and possibilities, is it possible to manifest ‘fixed lines of working’, ‘fixed worlds’, ‘fixed results’? Is it possible that any ‘fixed phenomenon’ will be ‘overpowered’ by all the infinite possibilities that are other then itself’? But actually, in the practical world, we see ‘fixed patterns’ to which our lives, acts, thoughts conform. May be that is the result of an ‘accident of development’ or ‘habit of past realised energy’. May be that some accidental potentialities of the Infinite arranged themselves in a way to give an impression of a ‘fixed pattern’ which will ‘remain in play so long as there is not the fiat that bids them to cease’ (Ibid, pg 125). Perhaps this is the origin of the thought which considers the world and the human drama the result of an ‘accident’ or ‘chance’. Sri Aurobindo answers this question from a pragmatic standpoint. He perceives a process, a ‘LAW’ that helps ‘self-directive’ knowledge to move to ‘self-determination’. HE ENVISAGES A LAW THAT COMMISSIONS A SELECTIVE FACULTY OF KNOWLEDGE TO SHAPE FINITE APPEARANCES OUT OF THE INFINITE REALITY. He explains ‘when we say,“God said, Let there be Light”, we assume the act of a power of consciousness which determines light out of everything else that is not light; and when we say ‘and there was light’ we presume a directing faculty, an active power corresponding to the original perceptive power, which brings out the phenomenon and, working out Light according to the line of the original perception, prevents it from being overpowered by all the infinite possibilities that are other than itself’. (Ibid, pg 125) It needs to be appreciated that ‘Infinite Consciousness in its infinite action can produce only infinite results; to settle upon a fixed Truth or order of truths and build a world in conformity with that which is fixed, demands a selective faculty of knowledge commissioned to shape finite appearances out of the infinite Reality’(Ibid). 4)	This means that the INFINITE can get expressed in the Finite. But the full splendour and ‘completeness’ of the Infinite cannot be ‘manifested’ in the finite – ‘ABSOLUTE COMPLETENESS IS NOT FEASIBLE IN THE FINITE BECAUSE IT IS ALIEN TO THE SELF-CONCEPTION OF THE FINITE’(Ibid, pg. 123). Then what is the remedy? The finite cannot be satisfied with itself. It has to yearn for the infinite. Thus is justified the search for exceeding one’s limits, the “Adventure” for “transcending” oneself, the pursuit of knowledge, the seeking for God, the yearning for the Infinite, the impulse towards a growth in consciousness, the cry for ‘evolution’. That is how ‘THE WORLD EXPRESSES A FORESEEN TRUTH, OBEYS A PREDETERMINING WILL, REALISES AN ORIGINAL FORMATIVE SELF-VISION – IT IS THE GROWING IMAGE OF A DIVINE CREATION’ –(Ibid pg.130). 5)	How do we deal with the Higher or Divine Maya? We discussed that Sri Aurobindo described that the lower or illusory Maya had to be ‘embraced’ first and then ‘overpassed’ as the Divine had plunged into ‘division’ and ‘limitation’ to be reconstructed again in its original unitary poise. In contrast the Higher or Divine Maya has to FIRST OVERPASSED, THEN EMBRACED. Why? Because the unitary poise of the Higher Reality consented to be delinked into finite forms so that each finite form can grow into its greatest individual potential before it realises its ‘enriched unity’ with all other forms, ‘for it is God’s play of the infinities of existence, the splendours of knowledge, the glories of force mastered and the ecstasies of love illimitable where He emerges out of the hold of Force, holds her instead and fulfills in her illumined that for which she went out from Him at first’ (Ibid pg. 126).This means that the unity that is reconstructed after the ‘finite’ variants manifest their highest potentials is not a blank, featureless, uniform unity of the unmanifested poise of the Infinite or the equally blank , meaningless unity after ‘liberation’ from the world of finites. Instead it is a rich variegated ‘multiple’ unity where the raison-d’etre of manifestation has been fulfilled! b)	It justifies the modern and phenomenal truth of ‘evolution’ in the Universe (which is now expanding into the realms of consciousness research). ‘To this mutual self-discovery and self-illumination by the fusion of the old Eastern and the new Western Knowledge the thought of the world is already turning’ (Ibid, pg. 124). All had a substance of Eternity.